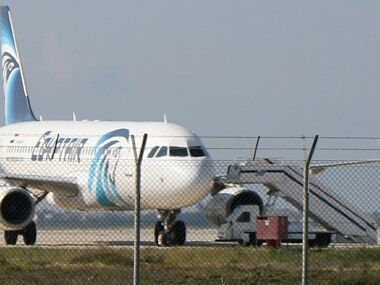 Larnaca, Cyprus: An Egyptian man hijacked an EgyptAir plane Tuesday and forced it to land on the island of Cyprus, where most passengers were eventually freed, though four crew members and three passengers remained on board with the hijacker, Egyptian and Cypriot officials said. A civil aviation official, also speaking on condition of anonymity because he wasn't allowed to disclose details of ongoing negotiations, said the man gave negotiators the name of a woman who lives in Cyprus and asked to give her an envelope. The relationship between her and the man was unclear. There was confusion about the hijacker's identity. At a news conference in Cairo, Egypt's Civil Aviation minister, Sharif Fathi, refused to identify him. The passengers released by the hijacker calmly walked off the plane down a set of stairs, carrying their hand luggage, and boarded a bus parked by the plane's side. Security was tight at the airport, with police repeatedly pushing back reporters and TV news crews working just outside the facility's fence, near where the aircraft stopped. US Homeland Security Secretary Jeh Johnson, appearing on MSNBC's Morning Joe program Tuesday, said that a "very good question" is whether the man who hijacked the plane Tuesday was able to pass through airport security with a bomb-laden belt.